We’ve had a comment on the blog from Phil. I did some research snooping to find out he has a blog and is about to commence having a narrowboat built by SM Hudson. The layout and equipment specifications look quite interesting and I will keenly follow the progress of the build. If you want to follow Phil’s blog it’s in our blog list to the right or you can click on this link <nb Achernar>. Good luck with the build Phil! This morning I discovered I hadn’t fixed the “noreply@blogger.com” issue <grrrr>. It’s getting to be like a bad penny. Or perhaps I’m reinfecting myself! Anyway, this morning I deleted a number of the blogger feeds so if you have subscribed to our blog posts through a reader rather than directly reading the blog you may have an old or corrupted link. I apologise if that has happened to you and can only suggest you delete the old subscription and re-subscribe. I think all this “purging” has finally fixed the problem. The problem is I don’t see the “noreply@blogger.com” link because it’s our blog. Nick Norman’s link to a different heat exchanger has resulted in me re-examining my original cost benefit calculations. This is what I’ve worked out. The annual fuel saving at £0.90/ltr is £122. Conclusion. If I were to purchase the parts and fit the heat exchanging system myself it would pay for itself in a year. This morning I had a good look in the engine compartment to see if it was physically feasible to install the heat exchange. The Beta 43 engine has two separate cooling ‘take off’ points. The larger of the two goes to the skin tank on the side of the swim where the hot engine coolant is cooled by the canal water. The second set of connections goes to the calorifier to heat the hot water. It makes sense to me that I should be utilising the hot water going the skin tank. Why heat the canal when it can be used to heat the interior of the boat. There is one potential issue with this approach. If the heat exchanger was to take too much heat out of the engine cooling system then the engine may run at too cold a temperature which might damage it. I need to check whether there is a thermostat in the engine system preventing too much heat being lost via the skin tank. Turning to the ability to physically install the components. This next photo shows the port side of the engine. 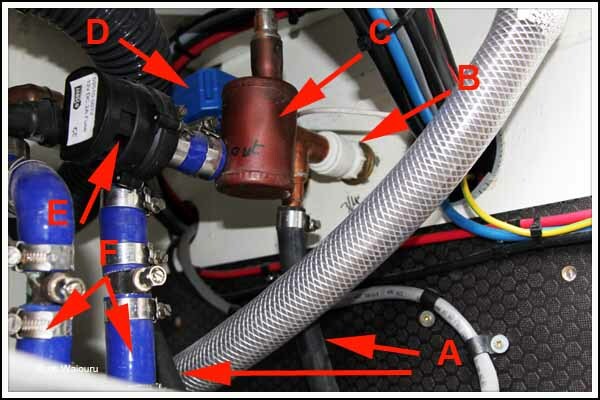 the arrows marked ‘A’ point at the existing cooling hoses between the engine and the skin tank on the swim. These would need to be ‘tapped into’ so water could be diverted to the primary side of the heat exchanger. 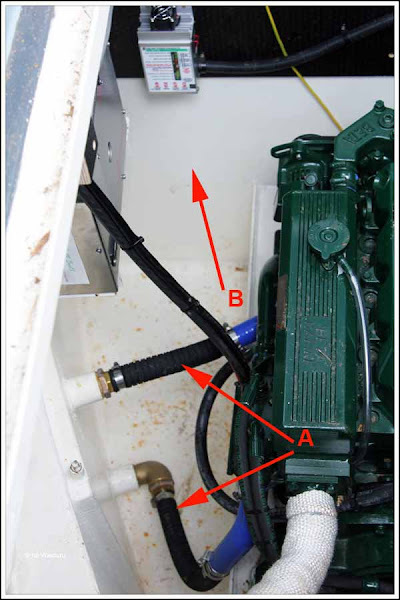 The red arrow marked ‘B’ in the above photo identified a vacant section of engine room bulkhead where some additional hexi-panel could be screwed and glued on place to provide a mounting for the heat exchanger. A heat deflector of some type would need to be positioned between the heat exchanger and the existing Sterling PDAR above or hot air would rise into the PDAR and potentially cause issues. The above photo shows the Hurricane Heater (arrow C) with the pipes to the second heater coil on the calorifier (arrow B). Arrow A points to the return connection from the boat heaters and the calorifier. The output pipe is behind it and obscured. The following photo provides a better view. D – 12v Isolation valve. It cuts off hot water to the cabin when only the water in the calorifier requires heating. F – Inlet and outlet hoses from the Hurricane boiler. 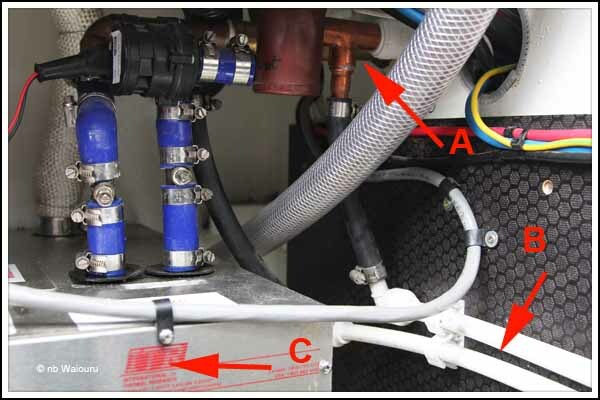 The problem I can see is an inability to connect the secondary side of the heat exchanger between the current Hurricane connections and the cabin (at arrow B). There appears to be insufficient room to fit a ‘T’ connection into this part of the system. More thinking is required. Fortunately I have plenty of time to think because any potential purchase is in the distance! Thanks for the endorsement I will try to make my blog as interesting and informative as the ones that have helped us. We hope you build goes smoothly Phil and look forward to seeing you somewhere out on the cut!